guest blog: Neal Brothers turns 30! Gluten Free Garage is one of our all-time favourite events! Not only do we get to share lots of yummy gluten-free goodies with everyone, we get to introduce exciting new brands and looks! This year is especially exciting for us, as Neal Brothers Foods turns 30. That’s right, the big 3-0, the dirty thirty, whatever you call it, we’re turning it! We are so happy to be at this point; Neal Brothers Foods has become so much more than a brand. It is a distribution company, it is a family, it is a household name, and it has brought various innovations to the market over the years. This year will be no different. Not only are we changing up the outside of our packages, we are also changing up some of the insides as well! Don’t worry, all the favourite snacks (corn salsa, blue with flax tortillas, etc.) are staying exactly as they are. But we have completely overhauled our pasta sauce and organic salsa lines. Our pasta sauce line is now 100% organic. In addition, we have added a flavour, Greens & Pepperoncini, to make a total of six all-organic delicious sauces. New formulations are currently out on the market in new packaging! Our organic salsa line has also had some tweaking, with new packaging and a new formulation inside, giving a fresher and lighter taste! Neal Brothers at the 2016 Gluten Free Garage! 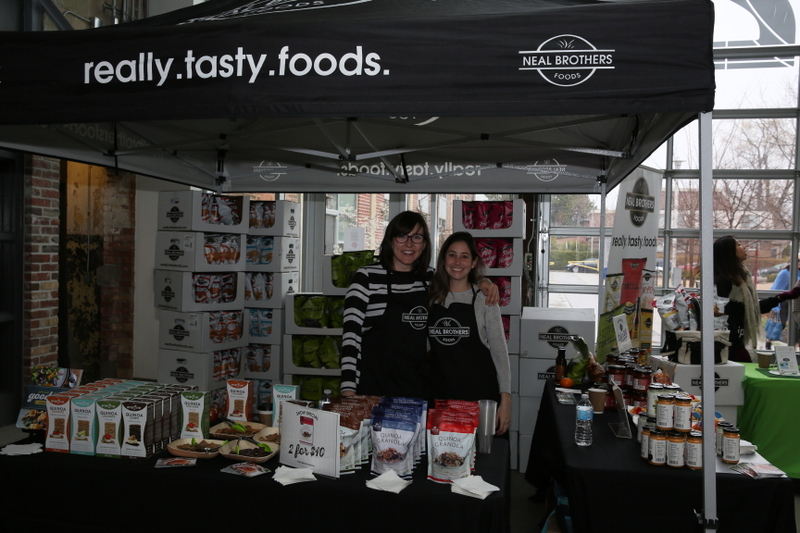 Neal Brothers Foods has been a sponsor of Gluten Free Garage since the very first event in 2012! 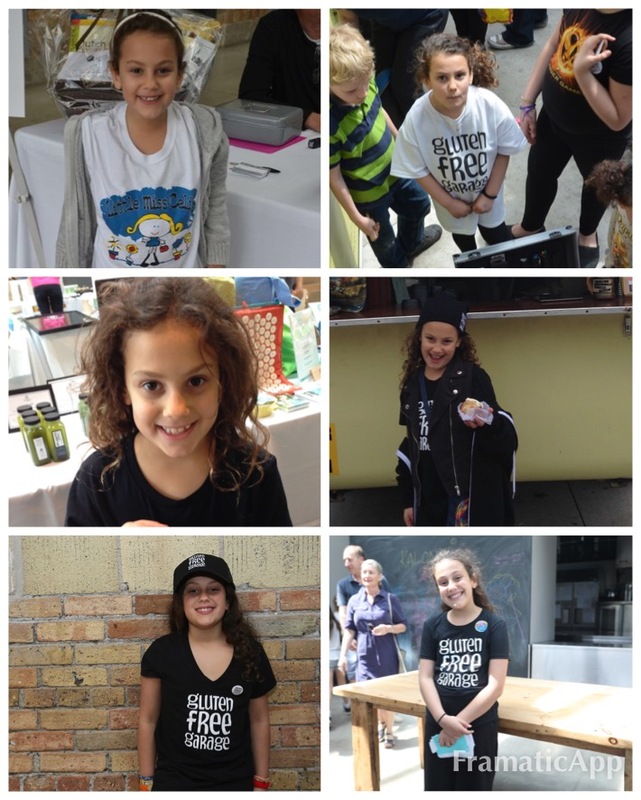 Look for their booth at the Wychwood (east) side of Artscape Wychwood Barns. Posted in Event info, GFG sponsor!, GFG updates, Guest blog, Products we ❤, Tummy love. It’s Celiac Awareness Month and the Canadian Celiac Association (CCA) is urging people to #GoBeyondTheGut. When most people think of celiac disease, they think of gut and digestive issues—diarrhea, constipation, bloating, cramps, stomach pain, gas, weight loss. But what about the less obvious signs of celiac disease? For more detailed information about each one, click here. According to the CCA, “over 80% of people with celiac disease have yet to be diagnosed.” Is it because they don’t have the classic signs of celiac so it’s not even on their radar? Very possibly. That is why it is so important to be aware of the less common signs. Celiac disease goes beyond the gut—it’s autoimmune, it impacts the whole body. Check out this brilliant infographic from Gluten Dude, showing 84 different symptoms of the disease. That’s right, Ontario is the only province that does not cover blood screening of celiac disease! The CCA is advocating for this test to be made free. You can join them by downloading this petition and sending it to the CCA to your local Member of Provincial Parliament. The Gluten Free Garage muse at every GFG from 2012 to 2017. On a personal note, my daughter, Lily, presented with a lot of tummy trouble (bloating, constipation, pain) and then ultimately throwing up, which is what alerted us to the fact that something serious was going on with her. She was tired all the time, and her blood work revealed very low iron levels; she was on the verge of anemia. 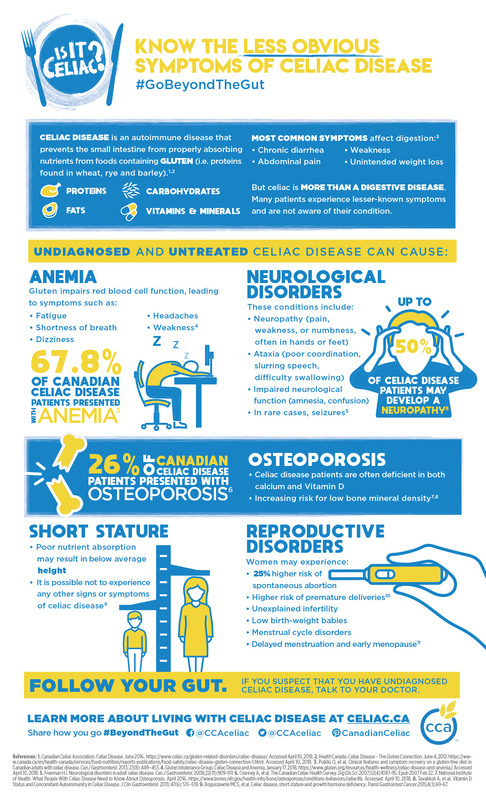 (Iron deficiency anemia is one of the most frequent presenting problems in celiac disease.) She was also below the average height for her age; “not thriving,” as the doctor put it. After our second visit to her pediatrician, he suggested we get her tested for celiac disease. He noted that the test wasn’t covered and I would have to pay for it. Soon after he called to say that Lily had celiac disease. Within two months of eating gluten free, Lily started to blossom. She wasn’t having stomach aches, her bloated belly basically deflated, and she stopped throwing up. She had so much more energy, her hair started growing, and she started to fill out in all the right places. All because we removed gluten from her diet (which definitely took some trial and error!). We’re so lucky she was diagnosed at the young age of three. In those early days, the CCA was a big help to our family. I went to a few informative evenings held by our local Toronto chapter, where I learned about different aspects of celiac disease and living gluten free. I didn’t leave my house without the CCA’s pocket dictionary of foods for the gluten-free diet (I still carry a worn-out copy around in my purse!). And when the kids were little our family went each year to the CCA holiday party where everything and everyone was gluten free! On May 16th the CCA is hosting a free webinar on children and celiac disease. Pediatric gastroenterologist Dr. Dominica Gidrewciz will review the classic and lesser-known signs and symptoms of celiac disease most often seen in children. And registered dietitian Jessica Wu will share how to maintain and improve your child’s health after diagnosis. To give back to the Canadian Celiac Association and help support the important work it does for and on behalf of people with celiac disease and gluten sensitivity, I donate a portion of the proceeds from GFG ticket sales to the organization. From advocacy to awareness, the CCA provides support, information and resources to people living with celiac disease. If we spread awareness about celiac disease, my hope is that more people will become aware of the myriad symptoms and will get tested and diagnosed so they don’t have to suffer short- or long-term. I also hope that by sharing stories about this autoimmune disease, people will realize that for more than 1 in 133 people being gluten free is not a choice but a treatment they require to stay healthy. For people with celiac, food literally is medicine. It should be delicious. On that note, there isn’t a better time to be gluten-free than now. Gluten free has come a long way, baby! Come taste for yourself at Gluten Free Garage on May 27th! This year the Canadian Celiac Association will have a table at #GFG18! Say hello to executive director Melissa Secord! Posted in Celiac disease, GFG exhibitor!, GFG sponsor!, Tummy love. Bring a non-perishable GF food item to GFG! WIFEY KNOWS BEST: Jessica Danford (aka Gfree Wifey) is on a mission. Last year Toronto’s Daily Bread Food Bank saw 990,970 client visits to the 100-plus food programs that it supports. When we consider that 1% of the population requires a gluten-free diet and that celiac disease is becoming one of the fastest-growing autoimmune diseases, access to safe food for all is a growing concern. This issue is often overlooked or not taken into account because most food programs are at capacity or struggling to provide to the clients they have before they can even consider food restrictions. One of the reasons I started the GfreeWifey Foodbank last year is to use my position as a positive influencer in the gluten-free community to bring greater awareness to celiac disease while advocating for access to safe food. 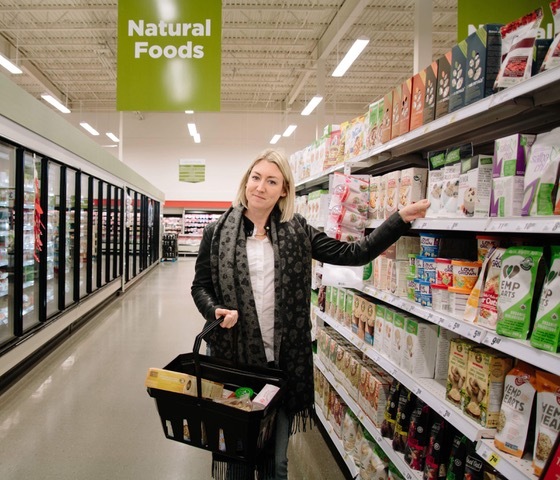 As someone with celiac disease who has used the help of food banks and food programs in my past, I feel passionate about this and am now in a position where I can champion for the cause. In April I donated $1,000 that we raised for the Daily Bread Food Bank! I do short-burst fundraising for local food banks and food programs to provide safe gluten-free food to people in our communities. If there is an organization you know of that needs support with access to safe food—whether it’s a food bank, before-or-after school program, soup kitchen, breakfast club or other food support system—please let me know. I will gladly learn about what they do and find the best way to support them. I will be at Gluten Free Garage on May 27th to meet everyone and collect non-perishable gluten-free food items for The Canadian Red Cross. The Red Cross provides emergency relief hampers with 3-4 days’ worth of food every two weeks to people who are in a vulnerable position and have been referred to the program by a professional. This is one of many organizations that have expressed they are at capacity and staggering to keep up with the demand, let alone provide safe food to people with dietary restrictions like gluten intolerance and celiac. gluten-free food item to Gluten Free Garage! There will be a collection bin at registration. If you forget your item at home, you can “buy two, donate one” at the event—it’s also a terrific way to support your favourite gluten-free vendors who will be there! Many people struggle to afford food—and we know how costly gluten-free food can be! A gluten-free diet is a necessity for 2 in 100 people. It is not a trendy lifestyle choice. It is mandatory in order for people with celiac to recover and maintain their health. Let’s work together to END HUNGER close to home. Posted in Celiac disease, GFG speaker!, GFG updates, Guest blog, Tummy love. 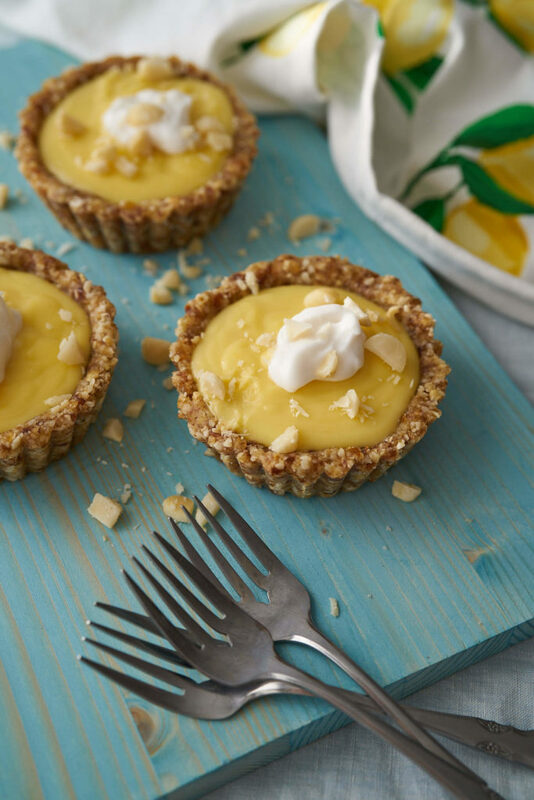 When life gives you lemons, make these no-oven, no-bake lemon tarts! 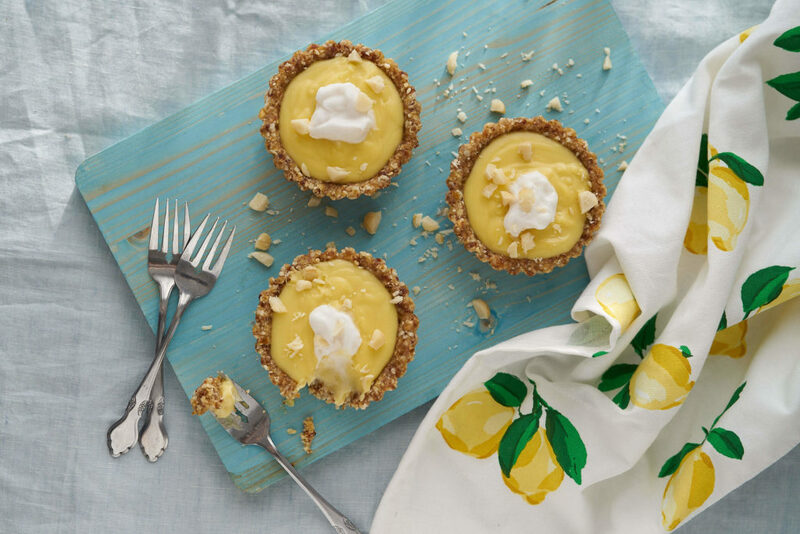 The second I saw these bright lemon tarts in a recent edition of the Joyous Health newsletter, I had to have the recipe. How creamy and divine do these look? I’m so happy to share the recipe here with you. These tarts were created by none other than holistic nutritionist and bestselling author Joy McCarthy, a woman who completely embodies her name. You just have to follow Joyous Health on Instagram to know what I mean. Lucky for us, Joy is returning as a vendor and a guest speaker to this year’s Gluten Free Garage! Be sure to stop by her table, where you’ll find her cookbooks, Joyous Health and Joyous Detox, along with her organic teas, body care (balms, body butter, deodorant and more) and new hair care products. 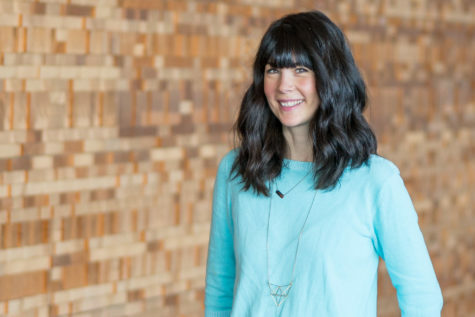 Joy will be giving her 45-minute talk “Gut Feeling: How your microbiome affects your mood, skin and stress levels” at 1:15 pm on Sunday May 27 at Gluten Free Garage. The microbiome encompasses tens of trillions of microbes that live on you and in you. The food you eat daily, your natural health supplement regimen and your lifestyle can either support these microbes or hamper them, allowing bad bacteria and yeast to proliferate. It’s absolutely fascinating how these microbes impact your mood, your skin and even your stress levels. In this session, you’ll learn about all the delicious and nourishing gluten-free foods you can eat daily to support a joyous microbiome! Please note: All speaker sessions take place in the Wychwood Barns Community Gallery at Artscape Wychwood Barns. The entrance is off of Wychwood Avenue (the northeast side of the venue). Space is limited so please arrive a few minutes early and form a line. And now for Joy’s lemon tart recipe, which we know you are sure to enJOY! To make the bottom crust, place all ingredients into a food processor and blitz until crumbly. Using 4 individual tart pans, evenly divide the bottom crust between them. Press the crust down firmly. Refrigerate or place in the freezer until it sets, about hour in the freezer or a couple of hours in the fridge. Meanwhile, make the lemon curd topping. In a large pot on the stove on low heat, whisk together the eggs, lemon zest and honey. Add the lemon juice, coconut oil, vanilla extract and coconut butter and continue to whisk on medium heat until everything is melted and the mixture starts to thicken. This process may take 10-15 minutes. DO NOT STOP WHISKING :) Whisk continuously until it thickens. Once the bottom crust is set, pour the lemon curd mixture into each cup. Put back in the fridge or freezer and wait until it’s set to enjoy. It will take about an hour in the freezer and a couple of hours in the fridge. Posted in Blogs we ❤, GFG speaker!, Guest blog, Happiness is..., Recipes we ❤, Tummy love. Sweet potato gratin lasagna made with Italpasta’s new gluten-free lasagna pasta and a creamy, dreamy béchamel sauce. What do you want first? The good news or the great news? 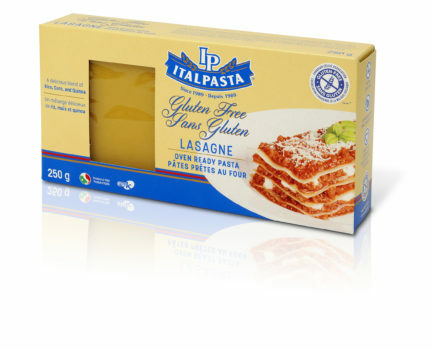 Our favourite gluten-free pasta brand, Italpasta, has added a new product to its gluten-free line: lasagna! Along with fusilli, penne, elbows and spaghetti, Italpasta now has five varieties of gluten-free pasta! Made from a blend of rice, corn and quinoa, this certified gluten-free and non-GMO lasagna has the flavour and texture of traditional pasta (it’s kosher too!). You would never know the difference. Plus, it’s oven ready, so you don’t have to boil the noodles before cooking them! So far we’ve made two hearty lasagna dishes at home—one with a meat ragu and the other a vegetarian version—and they are now family favourites! As a busy working mom, I really appreciate cutting down on prep time—just layer the sauce, pasta and cheese and put it in the oven. (The trick is to use lots of sauce and make sure the noodles are covered well.) Then wait for the sensational smell to fill your kitchen as the lasagna bakes and bubbles away! We are so excited to welcome back Italpasta as platinum sponsor! This will be their sixth time as lead sponsor of Gluten Free Garage! On May 27th at Artscape Wychwood Barns, they’ll be sampling three different delicious pasta dishes—including a lasagna—and will have vegan and dairy-free options. At every GFG there is a lineup at their booth for most of the day, but this year we might need to bring in some crowd control! 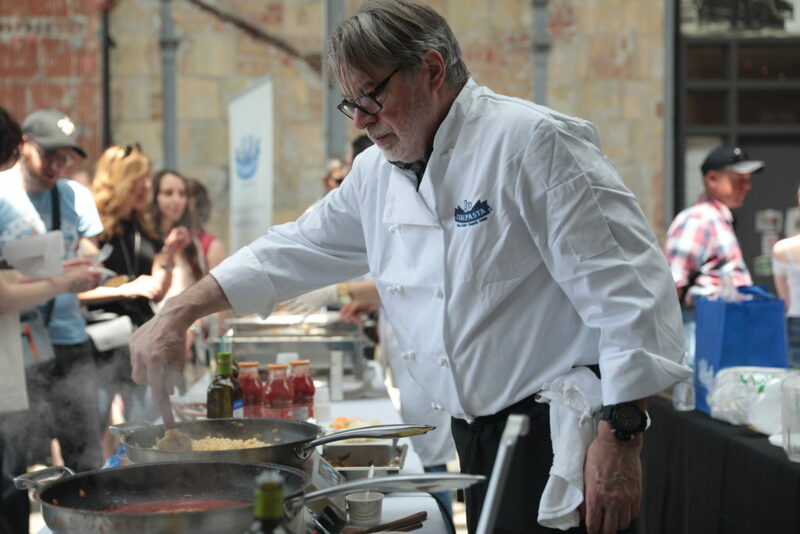 Italpasta’s Chef Gianni Ceschia making pasta for the people at last year’s GFG. Here’s a decadent lasagna dish to impress your family and friends. Preheat oven to 400°F (200°C). Toss together sweet potato rounds, olive oil and 1/4 tsp (1 mL) each salt and pepper. Arrange in single layer on baking sheet; bake for about 10 minutes or until tender. Reduce oven to 350°F (180°C). Grease 8-inch (2 L) square baking dish; set aside. Melt butter in saucepan set over medium heat; add sage leaves. Cook for about 5 minutes or until ends begin to curl and butter is browned but not scorched. Transfer sage leaves to paper towel–lined plate. Stir rice flour into butter in saucepan; cook for 2 minutes. Whisk in whipping cream, a splash at a time, until smooth. Cook, stirring constantly, for 5 to 7 minutes or until thickened. Remove from heat. Stir in remaining salt and pepper, Parmesan and nutmeg. Ladle 1 cup (250 mL) sauce into bottom of prepared dish. Top with one-third of the lasagne noodles, breaking noodles to fit snuggly. Top with 1 cup (250 mL) sauce, 4 sage leaves, 1 cup (250 mL) mozzarella, 1 tbsp (15 mL) hazelnuts and one-third of the sweet potato slices. Repeat layers twice. Top with remaining sauce and sage leaves. Place heart-shaped cookie cutter in centre of lasagne and fill with crumbled amaretto cookies. Cover with foil; bake for 45 minutes. Remove foil; bake for about 15 minutes or until noodles are tender and sauce is bubbling. Let stand for 10 minutes before serving. ♥︎ Grate whole nutmeg on a fine rasp for the best flavour. ♥︎ Pierce a medium sweet potato all over and microwave on high for 4 to 6 minutes or until tender. Let cool until easy to handle; peel and mash before adding to sauce if desired. 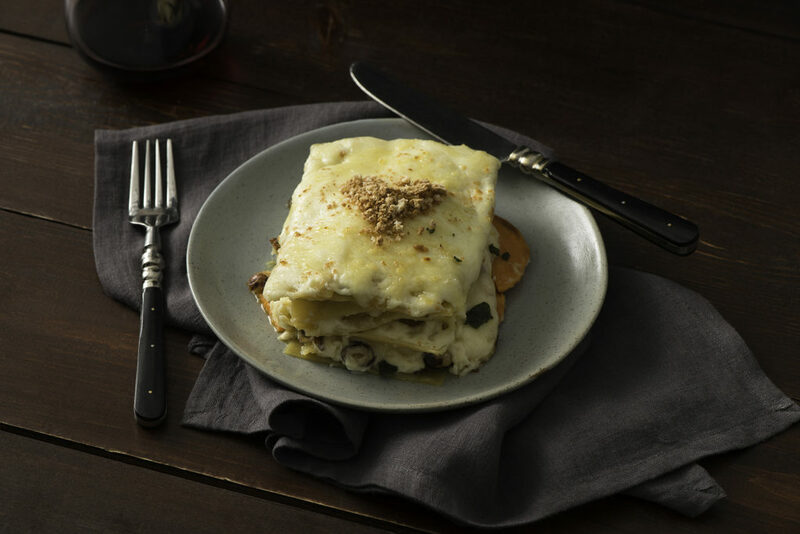 ♥︎ Add a layer of shredded duck confit to make an extra-special lasagna. Every gluten-free pasta lover deserves lasagna! Posted in GFG exhibitor!, GFG sponsor!, Happiness is..., Recipes we ❤, Tummy love.